What do you do if your water heater breaks down and you need to get it fixed as soon as possible? Hot Water is here to save the day! We offer quick, convenient, and affordable water heater repair services for all brands of water heaters, both tank and tankless. What makes our service in Panama City so reliable is the fact that we are on duty all day, every day, all year long. If your water heater breaks down on Christmas Day at 6 am or on a random Sunday evening at 11 pm, you can give us a call and we will come to your home or business and sort it out in a jiffy. You will never have to take a cold shower again if you save our number on speed dial now. Hot Water is located at 5117 Stewart Drive, but we’ve got water heater repair technicians on the move throughout the city. Our service trucks are out and about in the three-county area and if you give us a call, we will simply find the closest service truck and send them to your home or office. The best part is that we don’t bill you for a trip or service charge. We have years of experience in the water heater repair industry so we can give you a cost estimate over the phone before analyzing the situation in person. 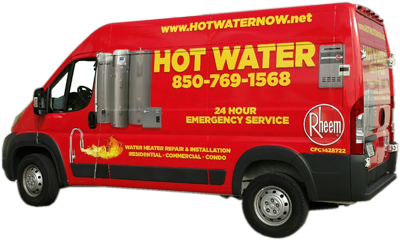 If you want fast, affordable water heater repair in Panama City, FL, call Hot Water at 850 769 1568 now. We offer solutions for leaking water heaters or any other type of water heater emergency.